One generic model of stream cipher considers updating the states and then combining the state bits to produce the key-stream. In case there are biases in the state bits, that may be reflected on the key-stream bits resulting certain weaknesses (distinguisher and/or key recovery) of the cipher. In this context, we study the state biases as well as key-stream biases with great details. We first experiment with cube testers and heuristically obtain several distinguishers for Trivium running more than 800 rounds (maximum 829) with cube sizes not exceeding 27. Further, we apply our techniques to analyze Trivia-SC (the stream cipher used in TriviA-ck AEAD scheme, selected in second round of CAESAR competition) and obtain distinguishers till 950 rounds with a cube size of 25 only. On Trivia-SC, our results refute certain claims made by the designers against both cube and slide attacks. Our detailed empirical analysis provides new results in reduced-round cryptanalysis of Trivium and Trivia-SC. 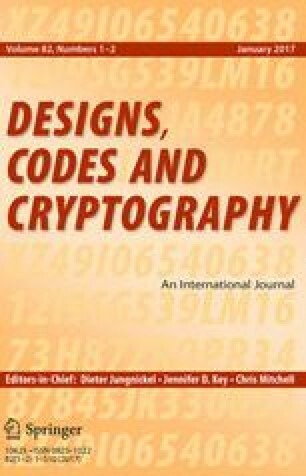 This is one of several papers published in Designs, Codes and Cryptography comprising the “Special Issue on Coding and Cryptography”. The authors like to thank the anonymous reviewers for their detailed technical as well as editorial comments that helped significantly in preparing this final version. The authors also acknowledge the support of Centre of Excellence in Cryptology, Indian Statistical Institute towards this work. This is an substantially extended and revised version of “New Distinguishers for Reduced Round Trivium and Trivia-SC using Cube Testers (Extended Abstract)” presented in WCC 2015, the Ninth International Workshop on Coding and Cryptography, April 13–17, 2015, Paris, France. Section 4 provide additional contents over the workshop version. New results on the first  and modified version  of Trivia-SC are also added. CAESAR: Competition for authenticated encryption: security, applicability, and robustness. Available at http://competitions.cr.yp.to/caesar.html. Chakraborti A., Nandi M.: TriviA-ck-v1. March 15, 2014. Available at http://competitions.cr.yp.to/round1/triviackv1. Chakraborti A., Nandi M.: TriviA-ck-v2. August 28, 2015. Available at http://competitions.cr.yp.to/round2/triviackv2. Chakraborti A., Nandi M.: Important features and flexibilities of TriviA. Presentation at DIAC (2014). Available at http://2014.diac.cr.yp.to/slides/nandi-trivia. De Cannière C., Preneel B.: Trivium. Available at http://www.ecrypt.eu.org/stream/p3ciphers/trivium/trivium_p3. Dinur I., Shamir A.: Cube attacks on tweakable black box polynomials. In: Eurocrypt 2009. LNCS, vol. 5479, pp. 278–299 (2009). See also: Cube Attacks on Tweakable Black Box Polynomials. Available at http://eprint.iacr.org/2008/385. eSTREAM: the ECRYPT Stream Cipher Project. Available at http://www.ecrypt.eu.org/stream/. GCC, the GNU Compiler Collection. Available at https://gcc.gnu.org/. ISO/IEC 29192-2:2012. Available at http://www.iso.org/iso/iso_catalogue/catalogue_tc/catalogue_detail.htm?csnumber=56552. Meier W.: Cube testers and key recovery in symmetric cryptography. Presentation at INDOCRYPT (2009). Available at http://indocrypt09.inria.fr/slides_cube_ind09. Sage: Open Source Mathematics Software. Available at http://www.sagemath.org/. Stankovski P: PhD thesis, Lund University, Sweden (2013). Available at http://lup.lub.lu.se/luur/download?func=downloadFile&recordOId=3799743&fileOId=3799763. Turan M.S. : Related Key/IV Pairs for Trivia-SC. Discussion at Google Group, 27 August 2014. Available at https://groups.google.com/forum/#searchin/crypto-competitions/trivia/crypto-competitions/Uzgt-2t3knM/kjv5kWKJ3nAJ. Vardasbi A., Salmasizadeh M., Mohajeri J.: Superpoly algebraic normal form monomial test on Trivium. IET Inf. Secur. 7(3), 230–238 (2013). doi: 10.1049/iet-ifs.2012.0175.